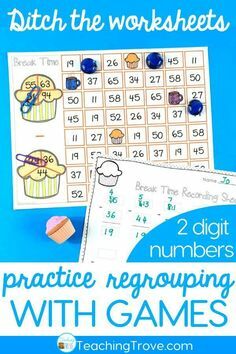 Have you ever handed out a subtraction with regrouping worksheet and watched your student’s eye glaze over? And yes, unless you’re just beginning to teach your class how to regroup with subtraction, they probably do know what to do – most of the time. But little mistakes can start to creep into their work – working from left to right (subtracting the hundreds first), forgetting to decompose the number first, confusing regrouping with addition to that of subtraction. Often when you leave a concept for too long kids forget or get confused. Do we really want to give out math worksheets to help them revise the concept? 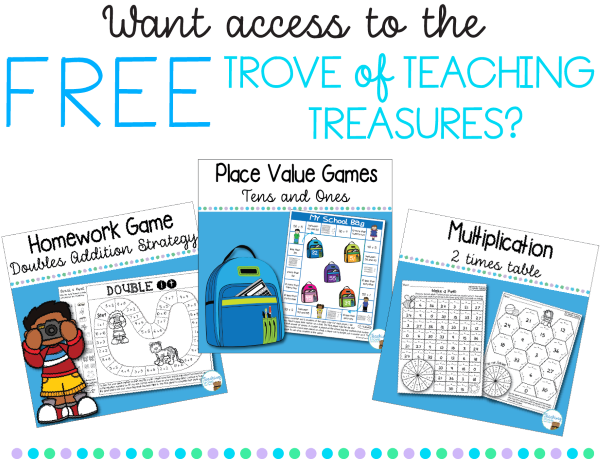 Math games are much more engaging! 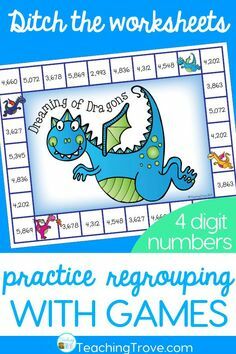 Games are a great way to make consolidating concepts such as subtraction with regrouping fun. Students answer the math problem they’ve spun, write it down on the recording sheet and answer it. By using recording sheets you can see the working out and gain a clear idea of who understands the concept and who doesn’t, making it ideal for assessment. With regrouping games, the answers are already on the game board. If they can’t find their answer, students need to check their work to find where they made the mistake. Mistakes can’t be ignored and students can’t complete a whole page of equations while ‘doing it wrong’. They get automatic feedback. In ‘Surf’s Up’ students need to get three in a row to win. The only way to have a chance at winning is to get the answer right. It’s important to consider how to group students at a math center. When a child can’t find out where they went wrong, often another player can if you have a mixed skills ability group. This makes it perfect for peer tutoring – something that isn’t possible when students are independently answering problems on a worksheet. Two, three or four players can help each other in ‘Bubble Trouble’. The first player to use all their counters in ‘Zappy Zoo’ is the winner. It’s the perfect opportunity for two players to practice answering ten number sentences correctly. 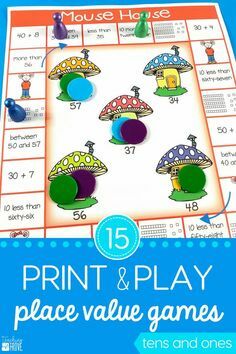 The game ‘Tea Time’ will identify any problems your students have with making a number sentence. If you see students writing the smaller number as the minuend, you’ll know they need to go back to basics. I love using games in the classroom. They’re a fun and motivating way to get kids to practice their skills. 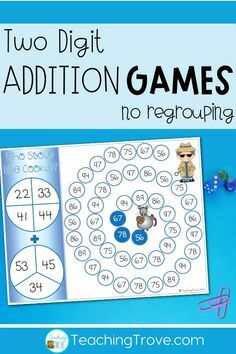 You can find subtraction with regrouping games in my TpT store. Just click on a picture below.